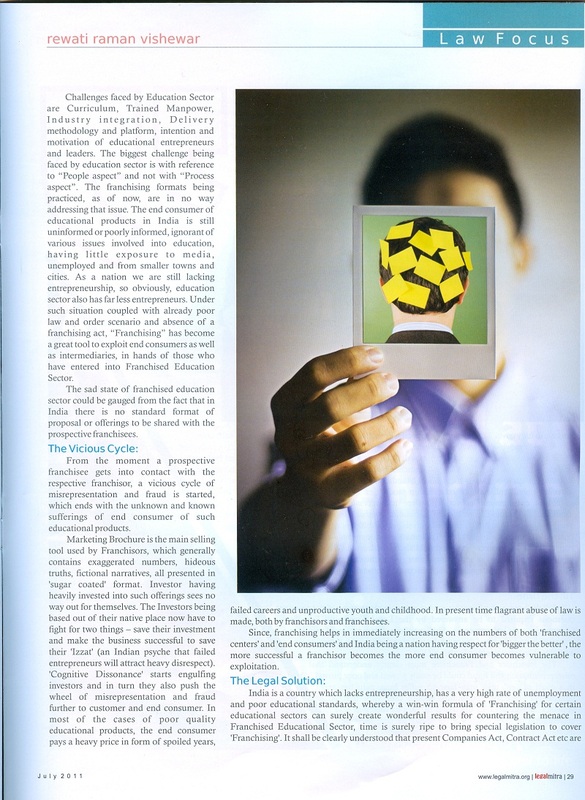 This Article was Published in India’s leading Law Journal – Legal Mitra in July 2011 edition. In present days of business, one tends to hear franchising more than Entrepreneurship or Enterprising. Franchising as a method of doing business and administration, dates long back to 1600 AD, and like many other formats of doing business and conducting administration, was brought by British in India. Franchising in India is predominantly present in Education Sector, however as a business format, is prevalent in various sectors like Food & Beverage, Hotel Chains, Automobile, Medical & Pharmacy, Textile, Manufacturing and others. Franchising is generally identified by the format of agreement ‘as such’ entered into, and other covenants like Franchise Fee, License Fee, Royalty, and Revenue Share. Person who holds right over specific brand name / trade mark and grants the right to use it to others is called ‘Franchiser’ and other person thus taking the rights to use such brand name, trade mark or process is called ‘Franchisee’. Simplest definition of Franchising is “replicating success”. Franchising connotes to the format of doing business whereby one transfers or shares his own right to do, already established and successful business under particular brand name, standardized business format, by commanding Franchise Fee, Royalty and other charges to any other person or business for a predefined term and territory. There are no specific Acts or legislation in India to regulate Franchising. In Education Sector franchising is used in Preschool, School, Vocational education, Skill Development Education, IT education, Management education, Entrance Test Preparation. Franchising is also used in Online Education / E-Learning. The big question is that whether franchising has contributed positively into development of such education sectors or into increasing satisfaction of end consumers? Challenges faced by Education Sector are Curriculum, Trained Manpower, Industry integration, Delivery methodology and platform, intention and motivation of educational entrepreneurs and leaders. Biggest challenge being faced by education sector is “People” and not “Process”, franchising formats being practiced as of now in no way addresses that issue. The end consumer of educational products in India is still uninformed or poorly informed, ignorant of various issues involved into education, little exposure to media, unemployed and from smaller towns and cities. As a nation we are still lacking entrepreneurship, so obviously, education sector also has far less entrepreneurs. Under such situation coupled with already poor law and order situation and absence of franchising act, “Franchising” has become a great tool to exploit end consumers as well as intermediaries, in hands of those who have entered into Franchised Education Sector. Sad state of franchised education sector could be gauged from the fact that in India there is no standard format of proposal or offerings to be shared with the prospective franchisees. From the moment a prospective franchisee gets into contact with the respective franchiser, a vicious cycle of misrepresentation and fraud is started, which ends with the unknown and known sufferings of end consumer of such educational products. Marketing Brochure is the main selling tool used by Franchisors, which generally contains exaggerated numbers, hideous truths, fictional narratives, all presented in ‘sugar coated’ format. Investor having heavily invested into such offerings sees no way out for themselves. Investors being based out of their native place now have to fight for two things – save their investment and make the business successful to save their ‘Izzat’ (an Indian psyche that failed entrepreneurs will attract heavy disrespect).’Cognitive Dissonance’ starts engulfing investors and in turn they also push the wheel of misrepresentation and fraud further to customer and end consumer. In most of the cases of, poor quality educational products, the end consumer pays a heavy price in form of spoiled years, failed careers and unproductive youth and childhood. In present time flagrant abuse of law is made, both by franchisers and franchisees. Since, franchising helps in immediately increasing on the numbers of both ‘franchised centers’ and ‘end consumers’ and India being a nation having respect for ‘bigger the better’ , the more successful a franchiser becomes the more end consumer becomes vulnerable to exploitation. India is a country which lacks entrepreneurship, has very high rate of unemployment and poor educational standards, whereby a win-win formula of ‘Franchising’ for certain educational sectors can surely create wonderful results. Considering the growing menace in Franchised Educational Sector, time is surely ripe to bring special legislation to cover ‘Franchising’. It shall be clearly understood that present Companies Act, Contract Act etc is not able to fully cover ‘Franchising’, and Franchising Legislation is required in addition to such laws. To begin with, standard format of Proposal, Offerings and presentation should be drafted by Legal drafters, which shall be followed by all Franchisers. Both, rights and obligations of Franchisers and Franchisees are to be clearly mentioned. It shall be required that franchisee agreement shall enlist all the relationship modalities. Legal drafters should understand that a successful entrepreneur is not equivalent to successful franchiser, and so criteria of ‘franchisability’ must be mentioned. Legislation must also include the minimum number of years of agreement to be entered into with respect to different education sector and renewal criteria. Although we already have Trademark and copyrights Act, but Trade mark usage, copyrights and process copyrights should also be addressed. What shall happen in case of operational failures of either franchisor or franchisee should also be included. It shall be a compulsion to include each discussion between franchisor and franchisee in writing. 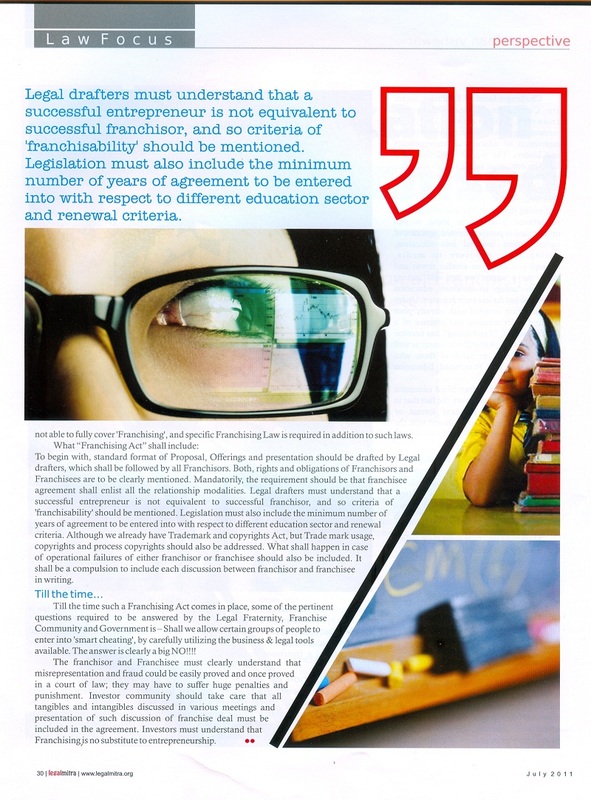 Till the time such Franchising Act comes in place, some of the pertinent questions required to be answered by the Legal Fraternity, Franchise Community and Government is – Shall we allow certain group of people to enter into ‘smart cheating’, by carefully utilizing the business & legal tools available. The answer is clearly a big NO. Franchiser and Franchisee must clearly understand that misrepresentation and fraud could be easily proved and once proved in court of law. They may have to suffer huge penalties and punishment. Investor community should take care that all tangibles and intangibles discussed in various meetings and presentation of such discussion of franchise deal must be included in the agreement. Investors must understand that Franchising is no substitute to entrepreneurship.